The Honda EU22i is the latest and greatest generator now available to purchase direct form Generator Place. We know you’ll appreciate the many excellent features this new model has to offer – and when it’s paired with the Honda brand, you can know for sure that this is a generator you can rely on. Honda has listened and given you exactly what you’ve asked for in the EU22i. When designing this new generator, Honda understood the increasing dependence on appliances in our everyday lives, and to meet the level of demand required by campers today; they needed to create a generator that combined the portability of the EU20i while also delivering more power. Honda has achieved this and more in the Eu22i. Following from the immense popularity of the Honda EU20i generator amongst campers across Australia, we’re sure the power, features and price of the EU22i will make it a new favourite. The EU22i includes everything you could ever want in a generator – all packed into a compact and portable case. Whether it be for home, recreational or professional use, you’ll find the features you need here. 4 Stroke120 Engine – 20% larger capacity compared to the EU20i generator. Built-in Eco-Throttle – For better efficiency. Oil Filter – With an increased diameter for improved draining and catching of oil. Easy Grip Handle – Located on top of the generator for easy lifting. Vented Cap – To ensure the fuse won’t come out in transit. Two 15 Amp Outlets – Can be connected straight to your caravan or appliances. 12 Volt Charging Outlet – Handy for charging up your battery when it’s flat. Parallel Leads – Giving you twice the capacity by joining two of these machines together. Economy Switch – In the on position, it will run at the lowest possible revs to give you the longest possible running time. Will run at maximum revs in the off position. The off position is ideal for charging and for heavy appliances. Oil Alert Light – Will alert you when the oil is low. Overload Light – Will flash red for 10 to 15 seconds if the machine is overloaded before reducing power. Machine On Light – A green light that lets you know the machine is running. Choke Lever and an Elastic Recoil Starter – For easy starting. The recoil starter has an improved handle and is surrounded by a metal reinforced area to prevent damage to the machine after long starting. New Fuel Switch Feature – An easy to use off switch for the fuel. If you’re not going to use the generator for a long time, simply run it at the ‘fuel off’ position until it runs out of fuel and switch it back on when in use. 4 Litre Fuel Tank – Allowing your power to last for longer. Whisper Quiet Operation – Perfect for campsites. With all these epic features available in the EU22i, there’s a stack of benefits you can gain. Long Lasting Commercial Quality Power – The powerful 4-Stroke GXR120 engine delivers better than commercial quality electricity with a maximum output of 2200W and up to 8 hours of continuous operation when the Eco-Throttle is activated. Easy to Start – When you own an EU22i, the one pull, easy start system means that your generator will start the first time, every time. Turning Off Your Generator – Thanks to the new fuel switch feature, you can stop your generator in a number of ways. Either turn the fuel switch to the ‘fuel off’ position and let it run out of fuel. This is ideal if you plan to leave it unused for a long period of time. Or you can just move it to the off position. You will be able to run a number of these appliances at once without overloading your generator. But if your generator does become overloaded, the EU22i will let you know when the overload light comes on. Environmentally Friendly – If you prefer a generator that’s eco-friendly, the EU22i has low emissions, making it a more environmentally sustainable option. 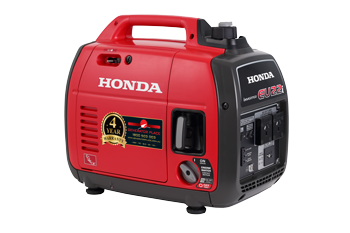 Extended Warranties – Extended warranties are available from 5 to 7 years when you purchase your Honda EU22i from Generator Place. You are covered for any manufacturer defects. As the only generator dealer in Australia with servicing outlets available across the country, we’re the only ones who can provide you with an extended warranty like this. We regularly have specials on our extended warranties, so check out our website for the latest deals. Is This the Right Generator for You? The brand-new Honda EU22i is a great all rounder with enough power to run all the essentials while also being small enough to take with you anywhere you go. Whether it be for home, recreational or professional use, the EU22i is bound to be the right fit for you. So, if you’re a camper with a caravan or camper trailer full of appliances to power or a tradie looking for a generator to take with you onsite, the EU22i is a great pick. Want to find out more? Take a look at our Honda Eu22i instructional videos – giving you an insight into everything you need to know about this model. If this all sounds too good to be true and you’re ready to make a purchase, head on over to the EU22i product page to make your purchase online or give us a call on 1800 442 447 for some friendly advice.